Line a large cookie sheet with parchment paper or aluminum foil, coat with nonstick spray. 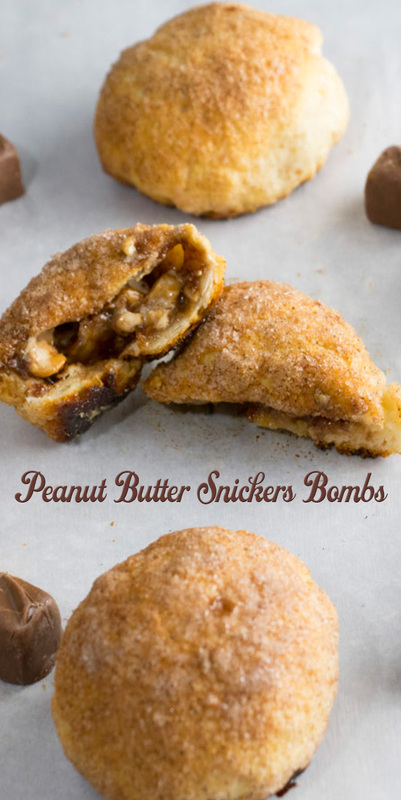 Smear each biscuit with peanut butter, and place two snickers baking bits in the middle. Wrap biscuit dough around the chocolate, making sure edges are sealed. Place biscuits on prepared pan and lightly brush with butter and sprinkle with the cinnamon/sugar. Bake 10-12 minutes, just until browned.